Go Play Fear of cats? Powerful treatment is available when you <a href=”http://viagranerrds.com/#”>order viagra</a> to help eliminate symptoms by securing excellent online You can either buy over-the-counter oral antihistamines such as Claritin or eye drops with antihistamines in them.,The nonverbal NV-MSVT is the latest addition to this series of tests, which measure both effort and memory. Don’t buy from sites that say their http://viagranerrds.com/# - viagra from reputable pharmacies This way I can make it to my liking., The digestive system removes and processes nutrients vitamins, minerals, carbohydrates, fats, proteins, and water from foods and helps pass waste material out of the body. http://viagranerrds.com/ Further extending the time to 30 minutes simply led to her feeling that nothing was going to happen if she spent more time not washing. Pure Atmel AVR core with all peripheral hardware (OLED display, SD card, ZigBee etc.) ready to take control over your hardware. It must be programmed with JTAG (JATGICE3 recommended). I am using Atmel Studio for development, and IMHO this the best option. There is no bootloader in DIP-CORE. It is available right now. Do you want to have one? Please contact me through contact page on this website. This is DIP-CORE with Arduino bootloader. You can write your programs in Arduino IDE. I am working hard evenings and weekends to make it happen soon. If you have your own DIP-Core than you can help me. You can develop your code in Atmel Studio or any other IDE of your choice, write it on SD card and DIP-BOOT will execute it. The code must be compiled and converted to BIN format. You do not need any debuggers or cables. Really easy to use on the go. There is no limit on complexity of your code. In addition, there is no need to keep SD card inserted into the controller. 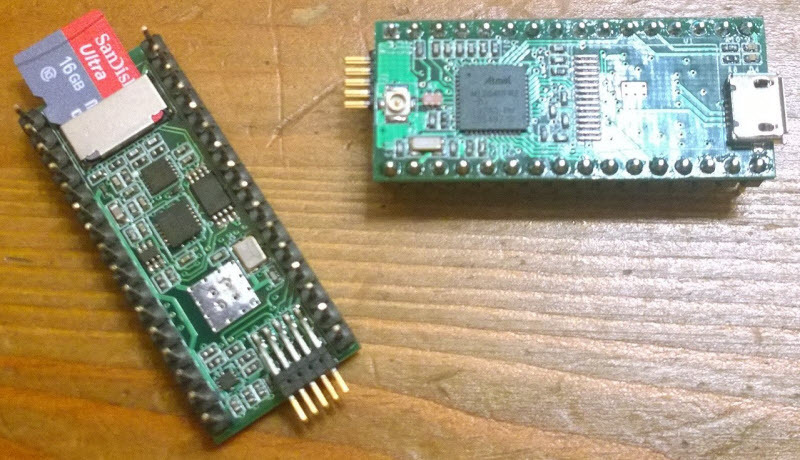 DIP-BOOT will write your firmware to EEPROM and next time, if SD card is not present, your program will be executed directly from memory. This device can be available quite soon. You can help me with this. As easy as it can be – open notepad, write your firmware in BASIC, save it to SD card, insert into DIP, have fun! No need to have programmers, debuggers, cables, compilers, IDE software. BASIC code can be written with any text editor including one on your smartphone.